This modul is great tool to define some kind of restrictions related to ordering products from your store. 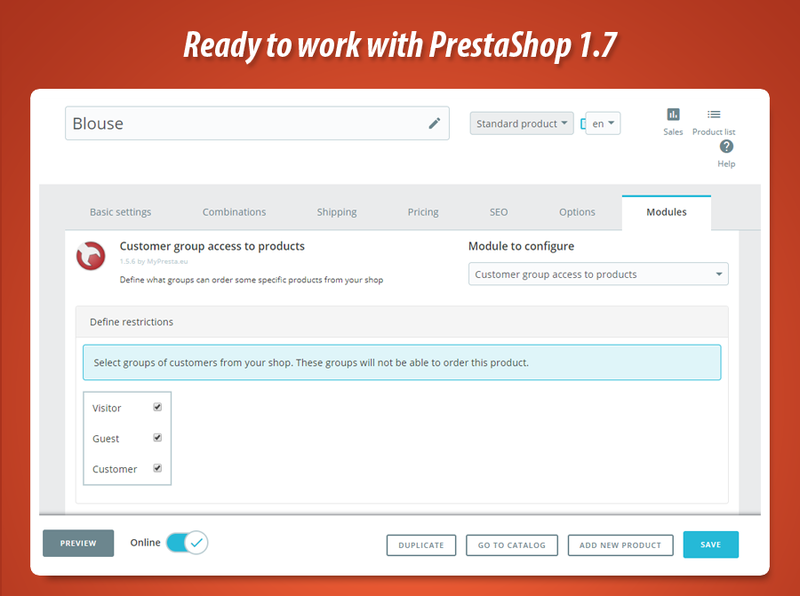 With this addon you can easily block possibility to order some of products for certain groups of customers. For example - It's a great way to grant access to products only for wholesalers, and block for retail customers. This module allows to do that! 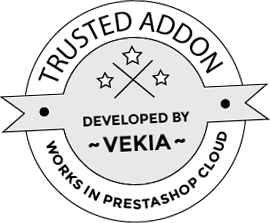 Each product can have own unique group access restrictions. Module is easy in configure. 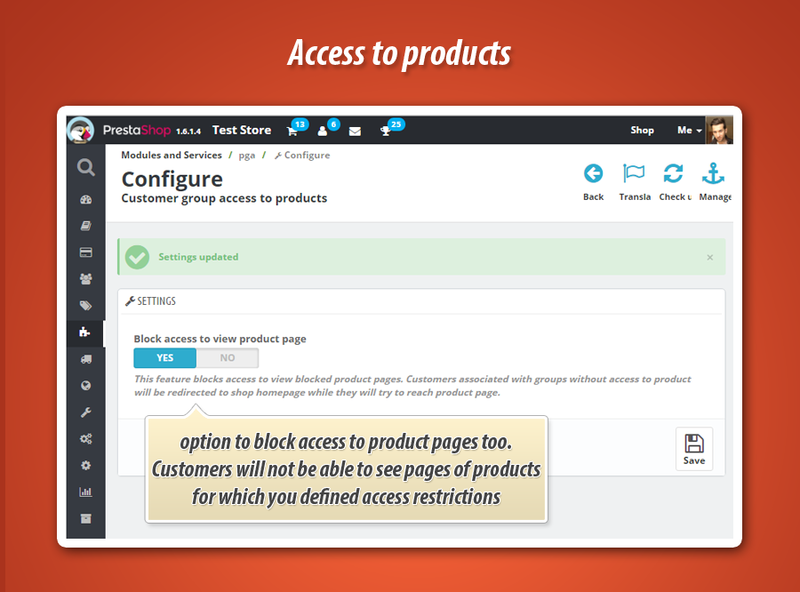 It adds new section on product edit page where you can define group access restrictions. Everything is easy to configure, you just have to select groups not allowed to buy product you edit. All of other things module will do automatically, you don't have to do anything more - you will save a lot of time. You can block possibility to view product pages. Selected customers (associated with selected groups) will not have possiiblity to see product pages. Great option especially if we want to hide products for them too. Sometimes our customer is associated with several groups of customers. These groups can have access to product, some other can't access to product. 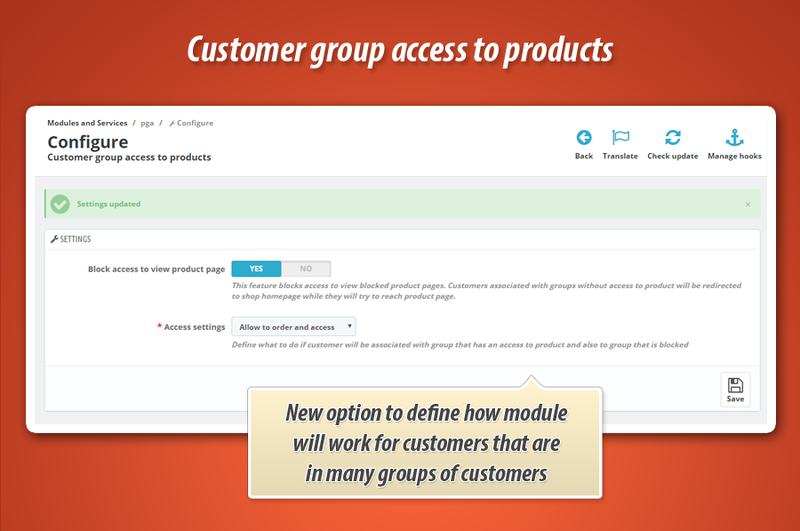 In this case you can decide what module will do if customer will be associated with groups that have access and without an access. 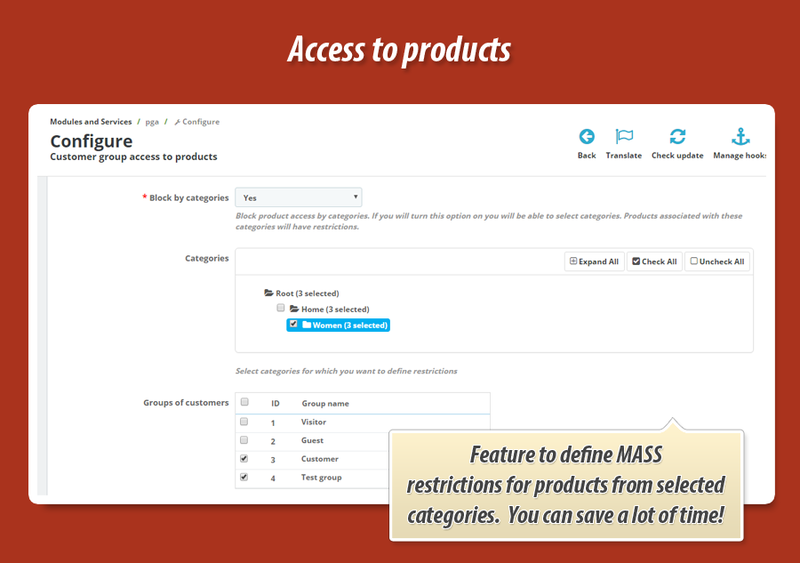 This feature allows to quickly defined access restrictions to products from selected categories. Feature allows to select categories and groups of customers. Customers from defined groups will not have possibility to order / view products associated with selected categories. It's a great way to define restrictions in bulk, and to save a lot of time (you will not have to define restrictions one by one for each available product). 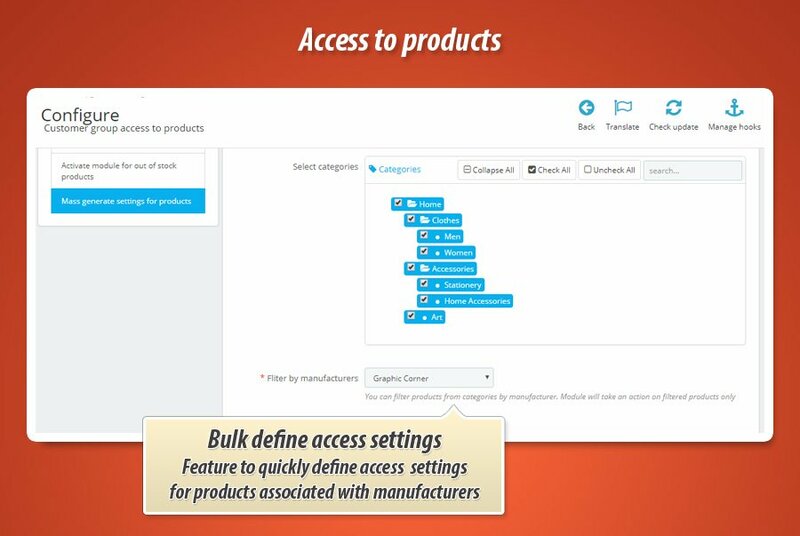 You have possibility to filter products from categories by manufacturer, so in effect you can define access privileges by group for products from defined manufacturers. Module has feature that hides produc with restrictions on list of products. 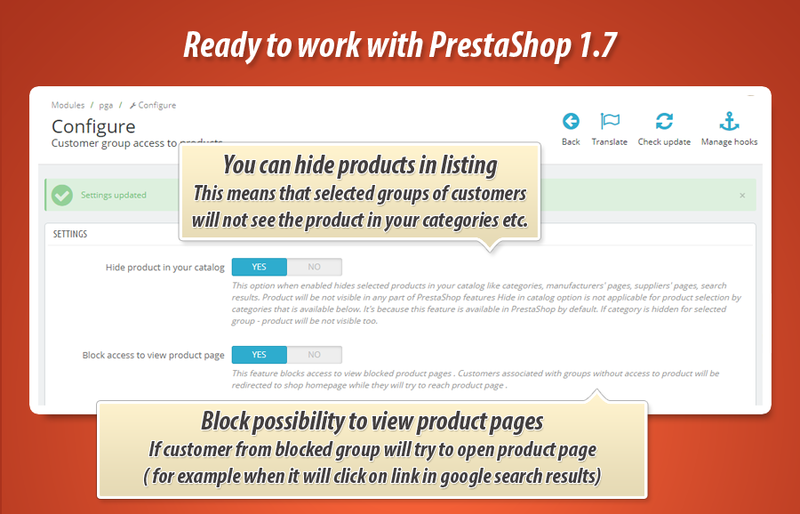 This means that product will be not visible in any part of prestashop feature like category pages, featured products, recently viewed products block, supplier page, manufacturer page, search results etc. 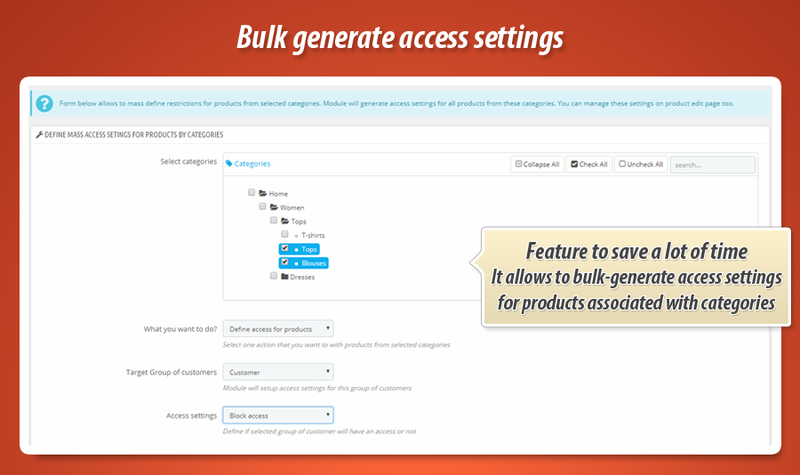 - added feature to bulk-generate access settings for all products from selected categories. 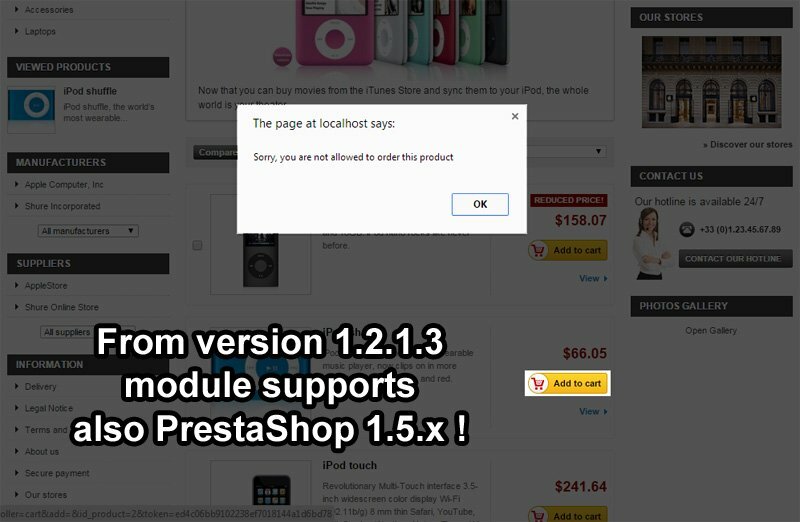 - released version dedicated for PrestaShop 1.7.x - so now module can work with new versions of presta! - added option to hide proudct also on list of products like: category pages, manufacturer pages, supplier pages, homepage featured products etc. 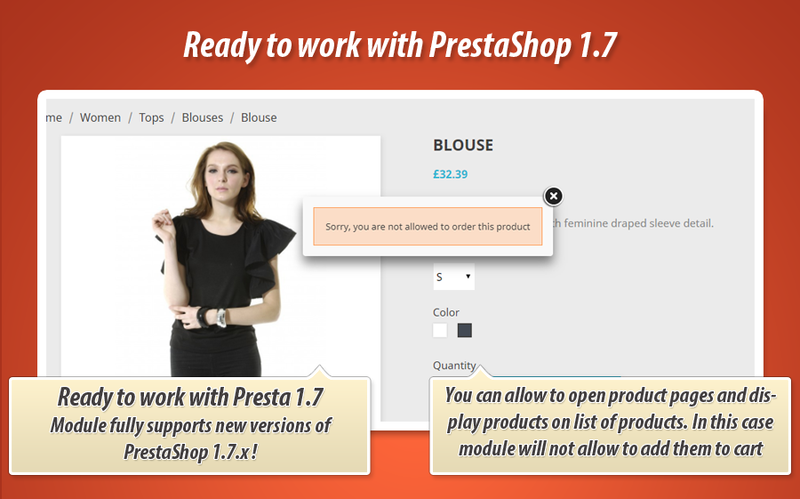 - added possibility to turn on "category restriction"
- module is ready to work with PrestaShop 1.7.x !